Democrats have some chances to pick up seats in the Texas House next year, with a dozen Republicans defending seats in politically wobbly districts. But watch those redistricting judges in San Antonio before you make any bets. 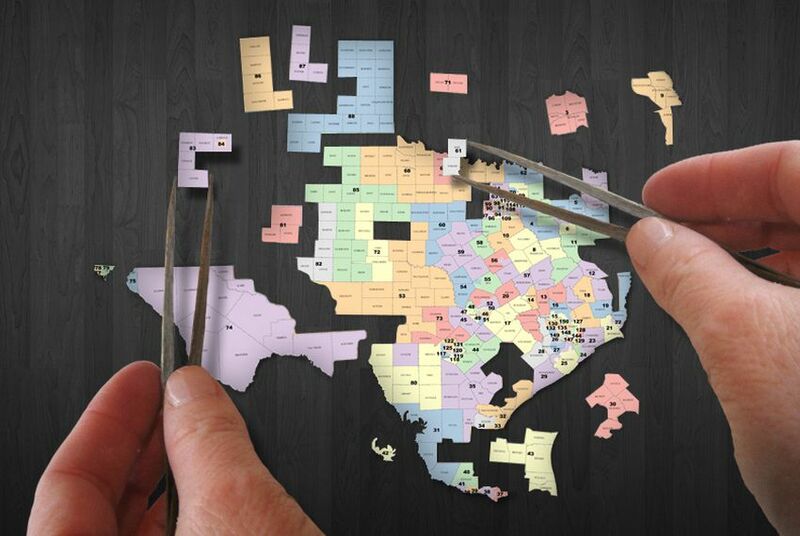 The three federal judges hearing the latest arguments in the state’s redistricting case could make significant changes to the makeup of the Texas House — if they decide to change the maps before next year’s elections. If they don’t — or if the changes they make are relatively minor — not very many House districts are competitive in a general election. The Texas Senate is out of the court’s reach; the political maps for those 31 seats were agreed to and blessed by both the courts and the state years ago. With a couple of exceptions, they’re not very competitive — at least in general elections. Democrats have a virtual lock on 10 seats, Republicans on 17. In the remaining seats, statewide Republican candidates and statewide Democratic candidates finished, on average, fewer than 10 percentage points apart in last November’s election. Fifteen Senate seats will be on next year’s ballot. State Sen. Konni Burton, R-Colleyville, is the incumbent in the closest district, where Donald Trump squeaked past Hillary Clinton by 0.59 percent — 1,806 votes out of more than 308,000 cast. Other candidates on the Republican side outperformed the president, winning by an average of 46.8 percentage points. Sen. Don Huffines, R-Dallas, represents a district where Republican and Democratic statewide candidates, on average, finished 8.9 percentage points apart. His is the only Republican Senate district where Clinton beat Trump (by 4.7 percentage points). Huffines wasn’t on the 2016 ballot, but he’s gearing up for a 2018 re-election bid. Republicans did better in the district represented by Sen. Joan Huffman, R-Houston — winning by an average of 12.2 percentage points in statewide races. But Trump’s winning margin was a mere 0.89 percentage points. Huffman’s seat will be on the 2018 ballot. The 14 seats where the margins were in single digits make up a preliminary target list. That’s unfortunate for the GOP because only two of the target seats are currently held by Democrats. Conversely, the list has Democrats dreaming of chances to cut into the 95-55 Republican advantage in the Texas House. What’s more, Clinton won in all but three of those seats, hinting at possible trouble for Republicans who will be running in the first midterm election of the Trump presidency. Which incumbents have trouble in the rearview mirrors? Democrats Victoria Neave of Dallas and Philip Cortez of San Antonio; and Republicans Rodney Anderson of Grand Prairie, Linda Koop of Dallas, Matt Rinaldi of Irving, Cindy Burkett of Sunnyvale, Sarah Davis of West University Place, Tony Dale of Cedar Park, Angie Chen Button of Richardson, J.M. Lozano of Kingsville, Jason Villalba of Dallas, Larry Gonzales of Round Rock, Gary Elkins of Houston and Dwayne Bohac of Houston. The federal judges way up there in the first sentence could change all of this. They’re at the end of a week of hearings over the congressional and Texas House political maps adopted in 2013 (after 2011 maps were tossed out as unconstitutional) to decide whether the state’s mapmakers cheated any of the state’s voters out of their electoral influence. If those judges decide the maps in use aren’t fair, the lines could be changed before the 2018 primaries and, with them, the odds for the incumbent members and incumbent parties in each district. Texas Democrats start the election cycle with a reasonable chance to pick up a handful of House seats. They’re hoping the courts put more districts in play. But they’d need to flip 21 seats to regain the majority they lost in the 2002 elections. That’s a stretch.